Green sea turtles (Chelonia mydas) are one of only seven remaining sea turtle species. These reptiles were classified as an endangered species on the IUCN Red list, following the abrupt decline of populations due to overexploitation and habitat loss. Although the green sea turtle is protected in Bahamian waters, it is still of great importance to investigate the factors that influence where juveniles choose to forage, as this life cycle stage is crucial to the species’ ability to grow and thrive. Seagrass beds play a critical role within this life cycle stage acting as a key food source for the green sea turtle, and therefore vital for development. 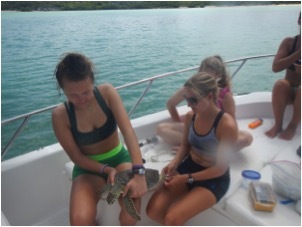 This summer, at the Cape Eleuthera Institute, Trinity College Dublin student Anna Whitaker, Oxford University student Alison Maughan and Royal Holloway University of London student Kate Rowley, aim to carry out research which could contribute to the improvement of future conservation efforts of the green sea turtle. A total number of 9 mangrove creeks were studied in this experiment. At each creek they visited, quadrats were placed and used for the investigation of seagrass structure, where percentage cover, species richness, and leaf canopy height data were collected. As well as this, environmental factors of the area, such as water depth, were studied. Samples of seagrass were also taken using a core. 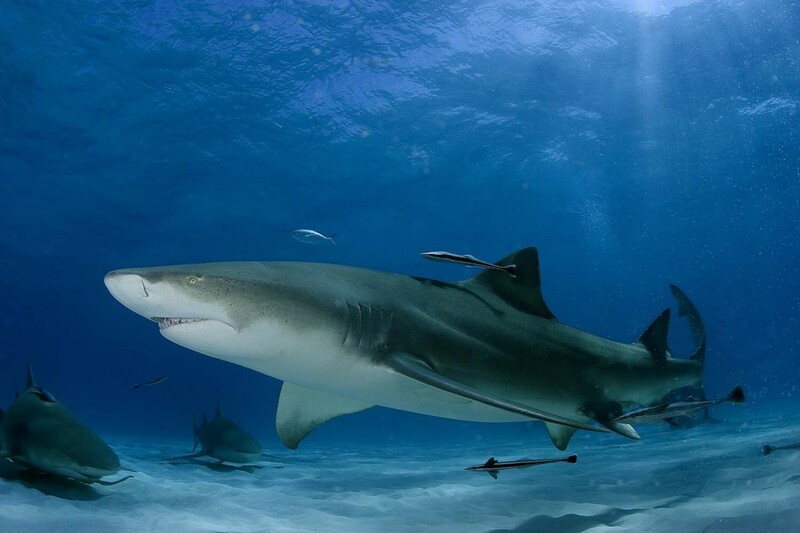 The Bahamas National Trust (BNT) joined the Government of St. Maarten, St. Maarten Nature Foundation, and The Pew Charitable Trusts as hosts of the Caribbean Shark Conservation Symposium, which took place from Tuesday, June 13 through Thursday, June 16. The gathering of Caribbean island government officials, environmental NGOs, and global shark conservation experts was coordinated to discuss the future of shark conservation in the region. As the first Caribbean country to establish a shark sanctuary and a leader in the region, the voice of the The Bahamas was represented at the meeting by Eric Carey, Executive Director of BMT. Also in attendance was Virgin Group Founder Sir Richard Branson, who has been supportive of establishing regional shark protections throughout the Caribbean, and cohosted a similar meeting in Bimini, The Bahamas in 2015. During the meeting, four Caribbean governments committed to help reverse this trend by fully protecting sharks in their waters. St. Maarten and the Cayman Islands announced that their economic zones (EEZs) are completely closed to commercial shark fishing. 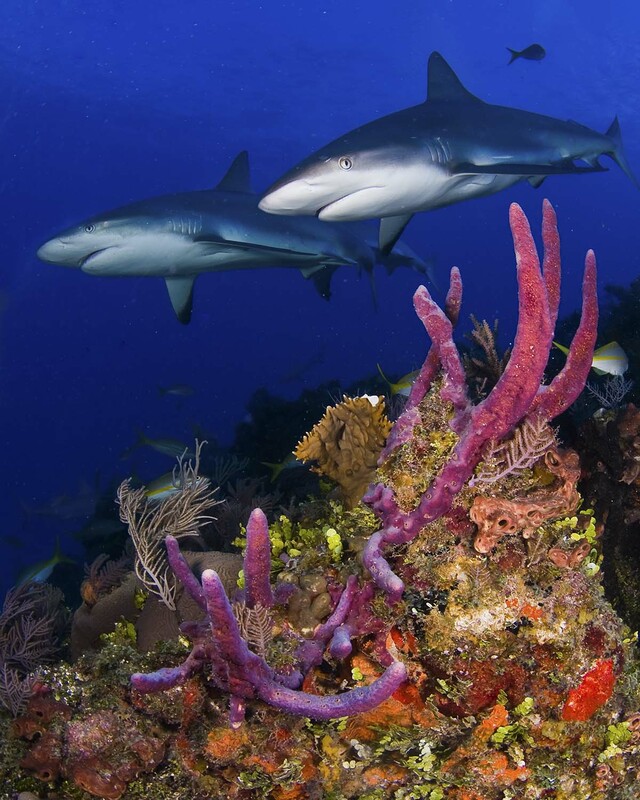 Additionally, Curacao announced that they will establish legislation this year that will protect sharks in their waters, and Grenada is considering measures that would safeguard sharks within the country’s EEZ. Together, the two new sanctuaries cover a total of 119,631 square kilometers and raise the total number of Caribbean sanctuaries to seven. The findings of a study of the economic impact of sharks on The Bahamas’ tourism industry were also released at the meeting. Lead investigator, Dr. Edward Brooks from the Cape Eleuthera Institute, was in attendance to discuss the study, which found that sharks generate US$113 million annually in direct expenditure and value added through tourism to the Bahamian economy. Sharks play a vital role in the Caribbean, both to the health of the ocean and to a countless number of people whose livelihoods are directly connected to these animals. With at least 100 million sharks killed each year, establishing additional meaningful and lasting protections in the Caribbean will ensure a healthy shark population for future generations. 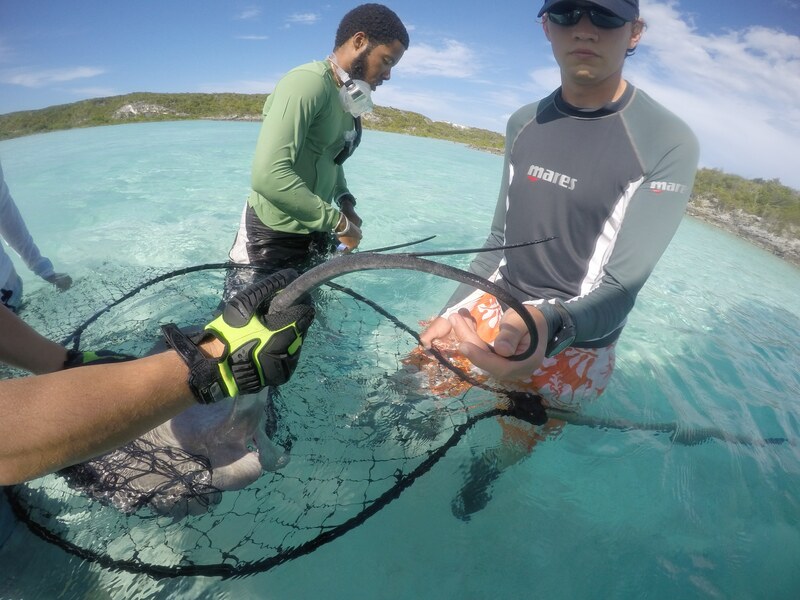 Recently, the Cape Eleuthera Institute’s Stingray Research Group mounted its final expedition to remote cays in the Exumas Islands, to finalize the collection of genetic information from the rare, elusive and recently ‘re-discovered’ Caribbean whiptail stingray, Himantura schmardae. Led by Dr. Owen O’Shea, the team comprised of interns, Rob Hallinan and Miguel Furtado, Newcastle University Graduate Student, Dan Montgomery and Education Program leader, Stan Burnside. The aim of this particular study is to assess the genetic connectivity of this batoid across multiple spatial scales, yet restricted temporal scales. Therefore, generations of parentage and sibling relationships are examined, rather than analyzing the connectivity through an evolutionary perspective. 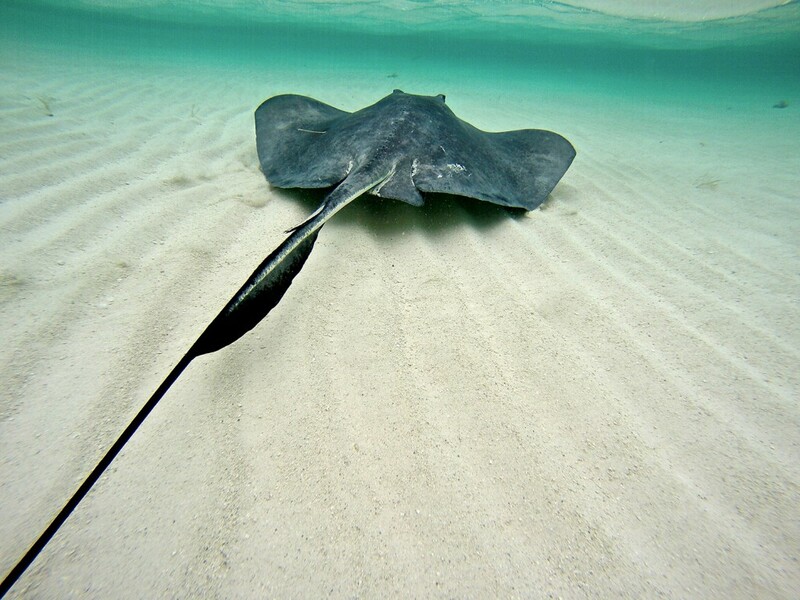 After crossing the Exuma Sound, the team first arrived at Little Creek in Guana Cay where the first whiptail stingray was located – a tiny female in shallow water as the tide ebbed. A further three more were sampled from Sampson Cay to the north, making the first day a success. The team was able to select their very own island for the night’s camping before readying the equipment for day two of three. The second day was even more successful; the team found and caught eight of these stingrays as they continued to move north. Three were found in the mangroves of Pipe Cay, two within the Compass Cay marina, and three found from a dry creek at Warderick Wells Cay. The little rays were the smallest of the project so far (228, 229 and 232 mm wide) but were also located in very small, very hot tidal pools scattered throughout a desert dry Banshee creek. Day three was more challenging as the team investigated several creeks from Shroud and Hawksbill Cays, that appeared promising, indicated by the presence of dozens of ray feeding pits. However, no whiptails were seen. 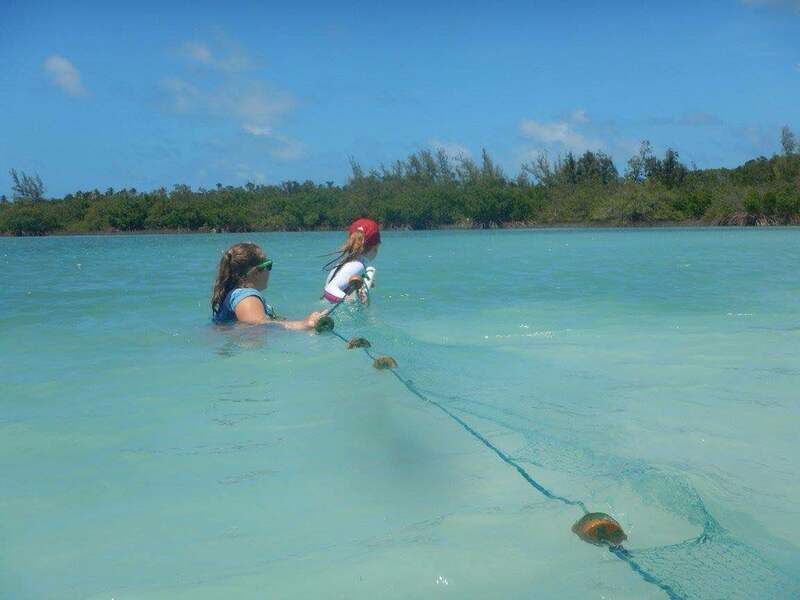 With only two samples left to meet the minimum requirement for sample size, the team explored the flats of Highbourne Cay and the mouth of Ship Channel Cay where three more whiptail stingrays were sampled, and therefore bringing the total for the trip to 15, five more than our target. Banshee Creek, Warderick Wells- there are two tiny whiptails in this tidal pool! This study is the first sine 1968 to document this species of stingray in The Bahamas, and a manuscript detailing their contemporary distribution in The Bahamas is currently under review. Now, with genetic information pertaining to 68 individuals sampled throughout the course of this study, spanning from Hummingbird Cay in the southern Exuma Cays to Hartford Creek, in the east end of south Eleuthera, Dr. O’Shea and his team can begin to analyze the relative relationships among these stingrays and determine their connectivity, along with possible migratory corridors, adding to the paucity of information not only about this species, but the habitats that support them. Interestingly, on this voyage, no mature stingrays were seen, potentially indicating a partitioning of spatial resources between juveniles and adults. 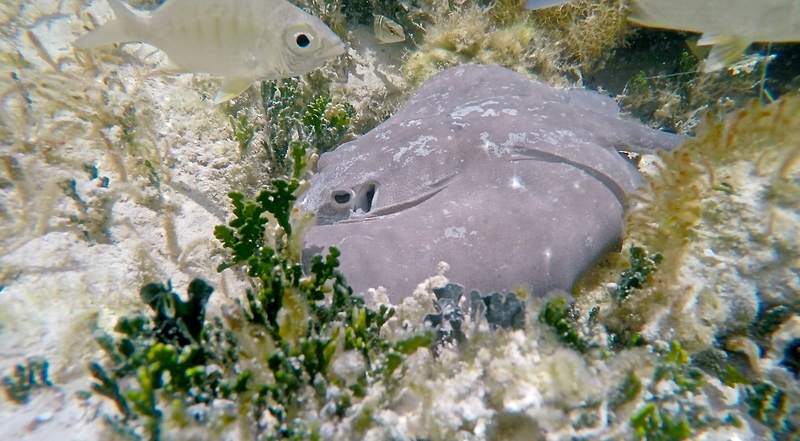 Where juveniles were more often seen in shallow creek systems, larger adults tended to occupy areas of deeper water, potentially highlighting the importance of creeks as nursery grounds for juvenile Caribbean whiptail stingrays. 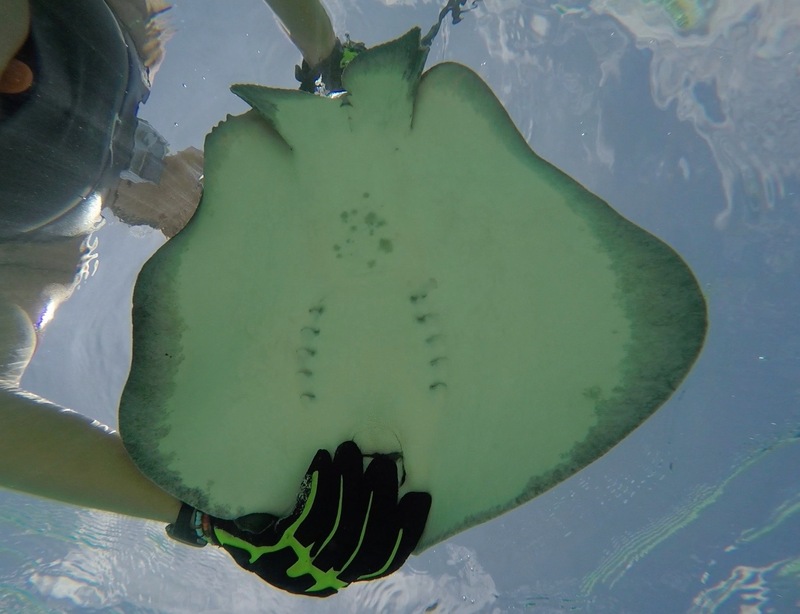 Continuing this research this summer, Dr. O’Shea will begin to assess the significance of these shallow, warm-water creek systems on the life-history of these juvenile Caribbean whiptail stingrays. 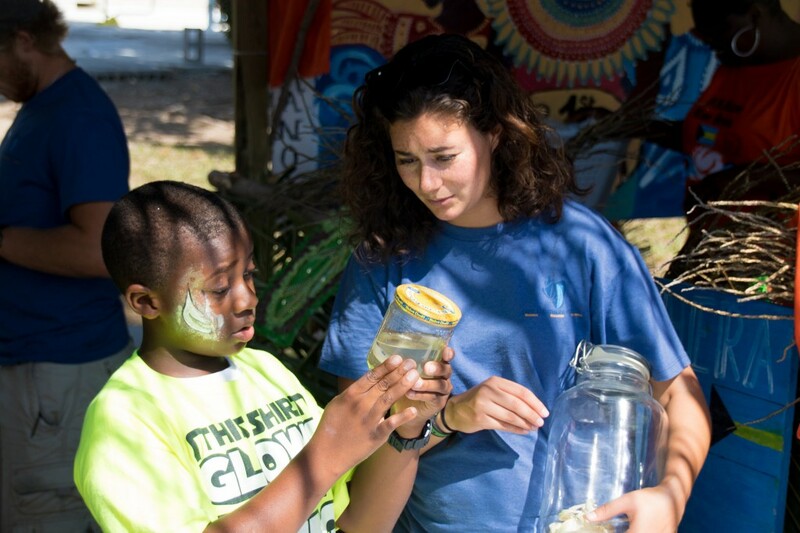 On Saturday, May 7th, the Reef Ecology and Restoration team at the Cape Eleuthera Institute (CEI) partnered with The Blue Seahorse gift shop in Rock Sound for a day of lionfish festivities. The afternoon was centered around different crafts and foods people can make with this invasive species. Delicious lionfish burgers were served at The Blue Seahorse and the reef team was able to demonstrate different aspects of lionfish research by teaching how to dissect and properly fillet a lionfish while handling the 18 venomous spines. A main goal of the reef team is to debunk the myth that lionfish are poisonous or deadly. The team even brought a live lionfish in a display tank to show how lionfish use their pectoral fins to herd juvenile fish for consumption. Reef team members Helen Conlon and Pauline Navaez educate visitors about invasive lionfish, how to properly fillet them, and how their fins can be used for jewelry. Artwork by Blue Seahorse owner Holly Burrows. Photo courtesy of The Eleutheran. Along with the current threats posed by the lionfish in the Caribbean, visitors also learned about the use of the beautiful lionfish fins for jewelry. Customers were even able to purchase lionfish earrings and necklaces that artist and owner Holly Burrows made. On Thursday, May 19th, Holly came down to CEI to host a lionfish jewelry making workshop. Participants picked their fins, taken from harvested lionfish, and with the guidance of Holly created beautiful sets of earrings and necklaces. Lionfish jewelry is a fantastic way to profit from the invasion, while also helping to create a demand for lionfish–and not to mention makes for a great gift for loved ones. 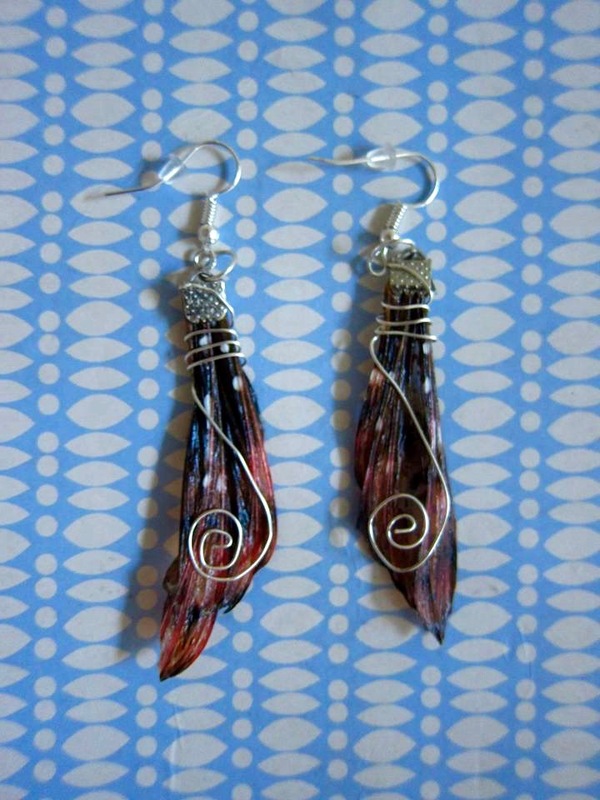 Lionfish earrings made by Helen Conlon during the jewelry workshop put on by Holly Burrows. Invasive lionfish in the Caribbean have a spawning rate of 30,000 eggs every four days, while having no predators in their invasive range. They also have the potential to reduce the abundance of fish on a reef by over 80%. 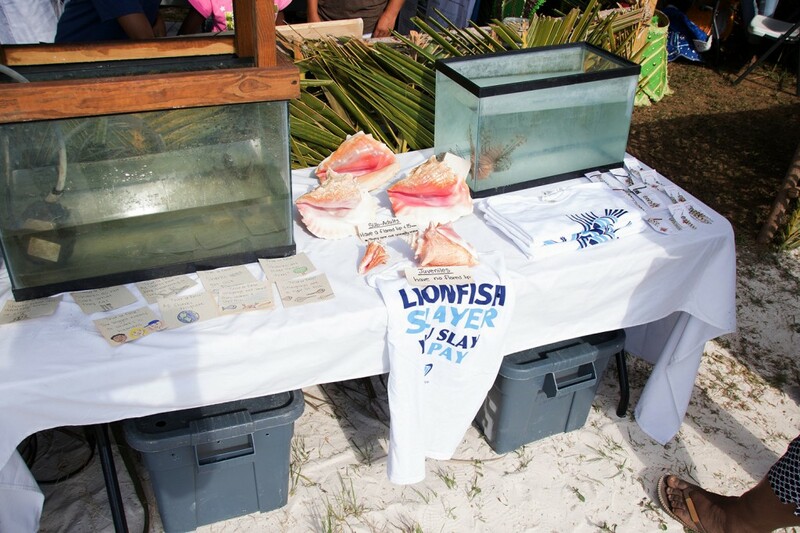 The Slayer Campaign, established by CEI, encourages the fishing and spearing of lionfish by local fisherman by paying fishermen for their catch efforts ($11/lb of lionfish fillet). Removing lionfish from local reefs not only benefits the coral ecosystem but, also provides CEI and the reef team with more lionfish to dissect for research. Discussing and displaying this ongoing research and effort with tourists and locals made lionfish day at The Blue Seahorse a huge success! Last week the CEI Sea Turtle Research Team had the opportunity to collaborate for the third time with Julius Rankine, who operates Fishbone Tours in Savannah Sound. Julius offers interactive expeditions including fishing, snorkeling, and learning about local wildlife conservation. For the last six years, he has also offered a turtle catching experience, contributing data to our sea turtle database. After hundreds of turtle chases, he has gained extensive knowledge of the turtles’ habitat and behavior, and the best ways to catch them. 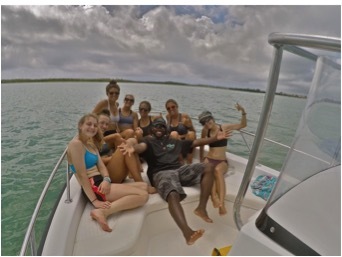 The sea turtle team and Julius aboard his boat in Savannah Sound. 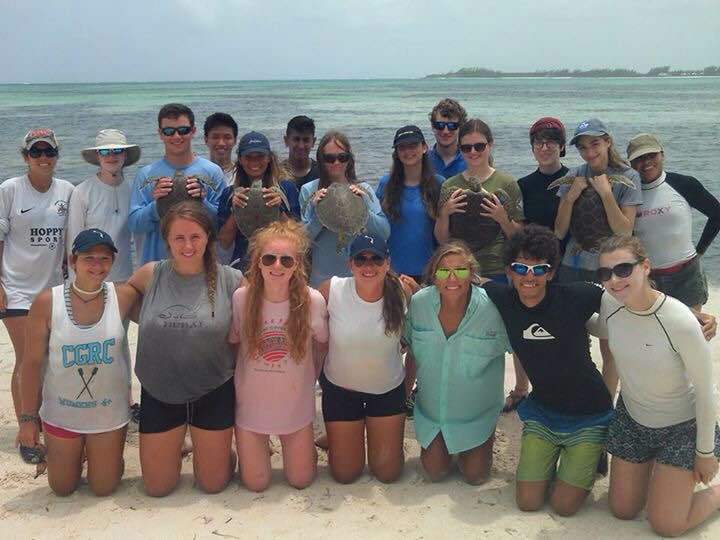 Our day was spent getting to know the area, learning about where each species of turtles can be found, and practicing the Bahamian method of catching a turtle. Julius was entertained by our official method of jumping off the side of the boat and swimming after the turtle, but didn’t think we would ever catch it. Instead, members of the team tried diving off the bow to get our hands on the turtle when they came up for air to avoid the tiring swim. The team caught and tagged eight new green sea turtles with his method, but the ninth proved too smart to let the boat get close. Finally, one of our interns jumped in the water, swam, and dove to capture the individual, proving that sometimes it takes more than one method to catch a turtle. Interns prepare to tag one of the nine new juvenile green sea turtles. Julius was able to teach us a great deal about Savannah Sound and the local turtle populations, while we shared more of our methods and research background with him. Tagging in Savannah Sound would present the opportunity to catch a new group of green sea turtles, as well as hawksbills and loggerheads, which are much more rarely caught and tagged around Eleuthera. On May 6th, Associate Research scientist Dr. Owen O’Shea and Shark Research and Conservation Program (SRCP) intern Nicole Firing from The Cape Eleuthera Institute (CEI) headed to San Salvador Island and Conception Island to start continue the Global Fin Print project in collaboration with The School of Marine and Atmospheric Science (SoMAS) at Stony Brook University, New York. Global Fin Print is an initiative that brings together elasmobranch researchers to help understand and fill knowledge gaps in the relative abundance of shark populations globally. Collaborators and researchers from multiple institutions world-wide have joined forces to better understand the influence of elasmobranchs on reef systems. Global Fin Print’s goal is to implement conservation efforts in areas where shark populations seem to be diminishing and provide an open-access database to the public for scientific and educational purposes. CEI partnered with SoMAS in to sample different parts of The Bahamas including Andros, Nassau, Conception Island, San Salvador Island and the Exuma Cays. 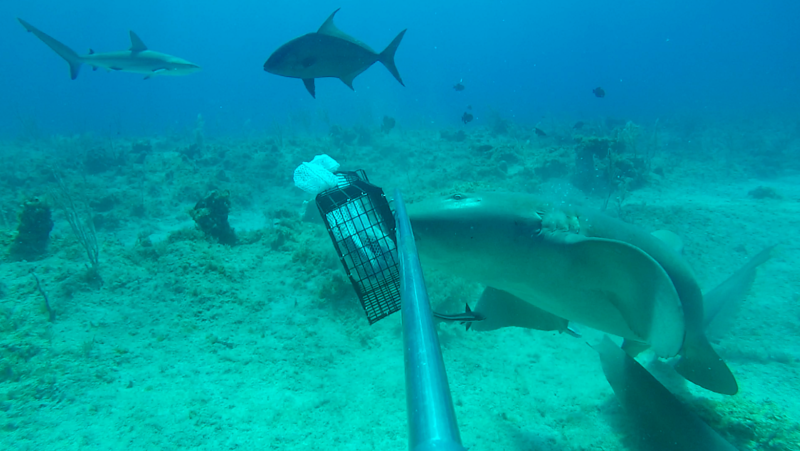 A nurse shark (Ginglymostoma cirratum) attempting to take a bite from the bait cage while a Caribbean reef shark (Carcharhinus perezi) and bar jack (Carangoides ruber) swim behind during a baited remote underwater video (BRUV) off of San Salvador Island, the Bahamas. San Salvador saw a total of 50 baited remote underwater video (BRUV) deployments across a spatial scale of almost 20 miles along the shelf reefs of the western side of the island. Each deployment ‘soaked’ for 90 minutes resulting in in 75 hours of footage. With over 50 world class dive sites located off the coast of San Salvador, this sampling area has been drawing divers in for many decades because of the steady population of reef sharks. Common species recorded were the Caribbean reef shark, nurse shark, Nassau grouper, red hind grouper, mutton snapper, bar jack and yellow tailed snapper. The second sampling location was the stunning and uninhabited Conception Island – 42 miles south west of San Salvador. Conception Island is a plateaued island in the Southern Bahamas with an extensive mangrove creek system taking up a large majority of the island and a large lagoon on the windward side of the island. This land and sea park has been a no take marine reserve for 5 years, is an important nursery for juvenile green turtles and nesting grounds for a range of birds including the magnificent tropicbird. This island also has the longest continuous ‘Montastrea’ coral reef in The Bahamas. 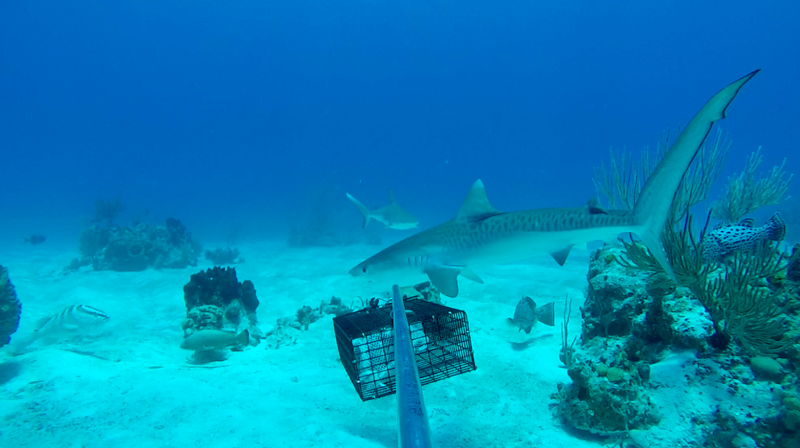 The team deployed 40 units totoalling 60 hours of footage and common visitors the cameras were Caribbean reef sharks, juvenile tiger sharks (Galeocerdo cuvier) and nurse sharks. A juvenile tiger shark (Galeocerdo cuvier, right) and a Caribbean reef shark (Carcharhinus perezi, left) swim by a baited remove underwater video (BRUV) off the coast of Conception Island, the Bahamas. Also pictured is a Nassau grouper (far left). The trip was hailed a success and will contribute to the growing knowledge base on our oceans top level predators. CEI would like to thank SoMAS and Stony Brook University for their continued partnership in ongoing research to understand the knowledge gaps of apex predators in The Bahamas. 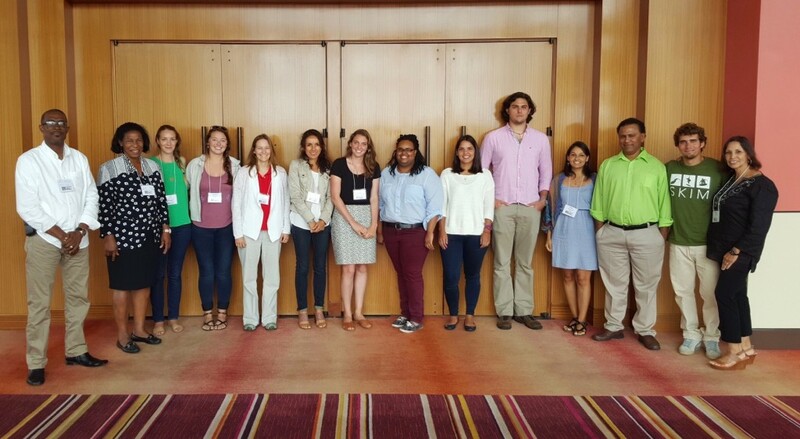 In April, Candice attended the Coastal-Marine Ecosystem Based Management (EBM) Tools Training in San Juan, Puerto Rico facilitated by Nature Serve. Thank you to Kinship Conservation Fellows for supporting Candice’s attendance to this event. 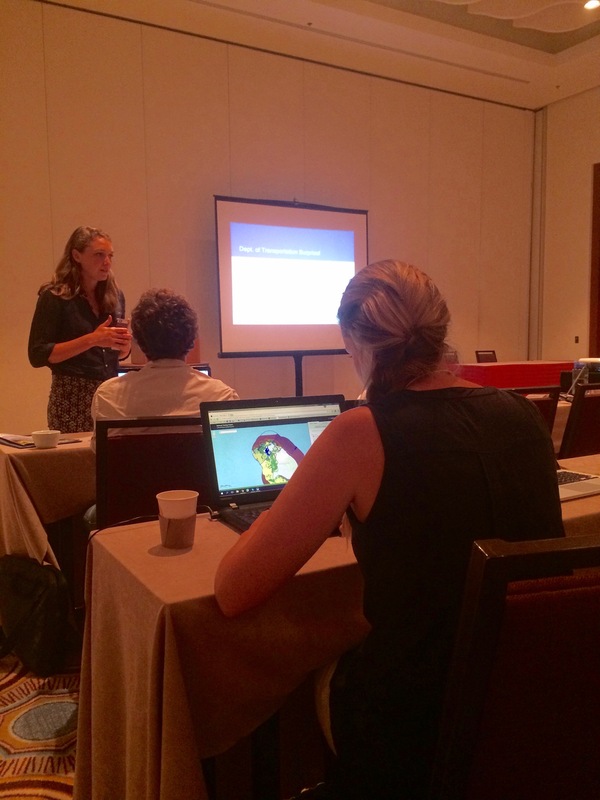 EBM Tools Network, a global network of coastal-marine EBM practitioners, researchers, and tool developers, facilitated the training workshop. 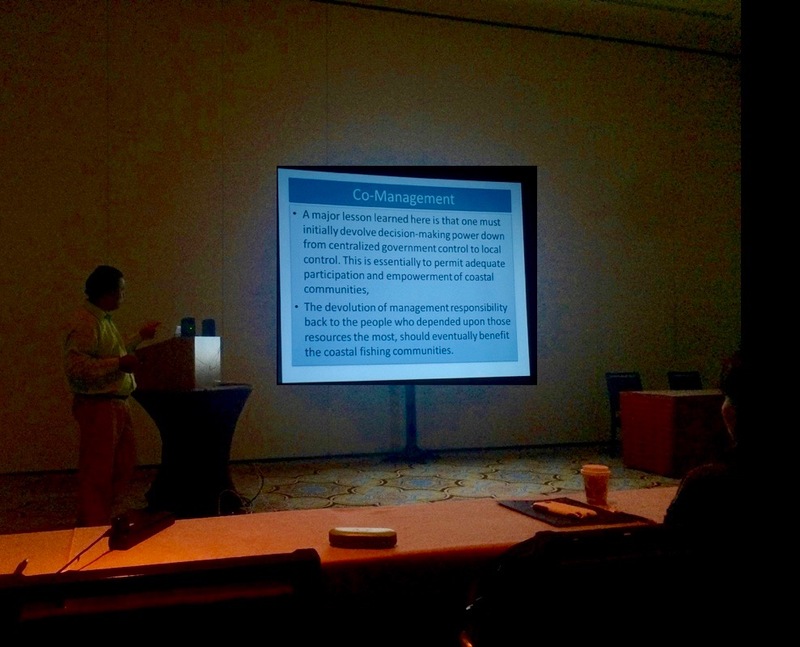 The session was designed to address the needs of coastal-marine conservation and management practitioners. Ecosystem-based management is an environmental management approach that recognizes the full array of interactions within an ecosystem, including humans, rather than considering single issues, species, or ecosystem services in isolation (Christensen et al. 1996, McLeod et al. 2005). Because humans depend on an array of ocean and coastal functions— including fish as food, for example — EBM recognizes that our welfare and the health of the environment are linked. Put another way, marine and coastal systems provide valuable natural services, or “ecosystem services”, for human communities. Therefore, to protect our long-term wellbeing, we need to ensure marine and coastal ecosystem functions and productivity are managed sustainably. This means managing them in a way that acknowledges the complexity of marine and coastal ecosystems, the connections among them, their links with land and freshwater, and how people interact with them (UNEP (2011): Taking Steps toward Marine and Coastal Ecosystem-Based Management – An Introductory Guide). Candice chose to join the marine spatial planning (MSP) and marine protected area (MPA) planning and management theme for the training session. The group discussed stakeholder engagement and co-management strategies for MSP and MPA planning and management, learning from examples in Colombia and Grenada. The group was given an introduction and overview of the United Nations Environment Program (UNEP), Caribbean Marine Protected Areas Management Network and Forum (CaMPAM). Dr. Martha Prada from UNEP gave a presentation on Design, Declaration and Implementation Strategies of the Seaflower MPA, a case of EBM in the Caribbean. This case study showed the complexities of MPA planning in Colombia and the need to engage all stakeholder groups, promote sustainable development in local communities, research & monitoring, environmental education, alternative livelihoods, licenses/permits, control pollution, and the implications of changing political climate. Roland Baldeo, the National Marine Protected Area Coordinator for the Government of Grenada, gave an example of applied EBM by incorporating pig farmers into MPA management plans. This was achieved by educating farmers about the importance of safeguarding coral reefs and associated ecosystems through sustainable land management practices. By taking farmers on excursions to the areas of coral reef being damaged by pig waste run-off, they were able to demonstrate the linkages between sustainable land management practices and the health of marine ecosystems. This formed the Reef Guardian Farmers group, which recognizes and promotes practices such as proper fertilizer application and good water quality and soil management practices utilized by farmers. Finally participants were trained to use Sea Sketch software by performing exercises from a MPA planning scenario in Barbuda using the program. This unique software enables users to not only incorporate biological data and habitat maps but also allows socio-economic data to be collected from stakeholders via an online link. This information is then visualized as a layer on the map. Fishermen in Barbuda were asked to identify their most important fishing sites, this allows for analytics to be run threw the software to quantify how many fishermen would be displaced based on various MPA placement scenarios, whilst also considering habitat and biological data. April saw the sixth successful annual research cruise to study oceanic whitetip sharks at Cat Island. Since 2011, the Shark Research and Conservation Program, along with long-term collaborators Microwave Telemetry Inc (www.microwavetelemetry.com), Stony Brook University, University of North Florida, and Florida International University, have worked closely to answer a number of questions pertaining to the life-history and behavior of a known oceanic whitetip shark aggregation at Cat Island, The Bahamas. The project is supported and co-funded by Blue Ocean Institute, Save Our Seas Foundation, and the Moore Bahamas Foundation. Working up an oceanic whitetip and attaching a satellite tag. 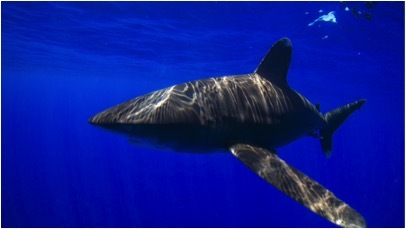 Historically, oceanic whitetip sharks were naturally abundant, and a common apex predator across the tropical and sub-tropical western Atlantic. However in the past 50 years, whitetip populations have come under severe threat as a result of the global fin trade. Oceanic whitetips are now categorized as ‘critically endangered’ in the Western Atlantic by the International Union of the Conservation of Nature (IUCN). Despite these pressures, the biology and ecology of this species remains highly elusive, highlighting a critical need for collection of these data from a management and conservation perspective. Determine generalized movements and determine high-use areas of sharks in relation to the Bahamas shark sanctuary. Examine diving behavior through high resolution temperature and depth data. Investigate potential hormone markers to identify reproductive cycles. Examine prey-preference potential seasonal diet switches through tracing relative concentrations of Carbon and Nitrogen isotopes. Gather baseline genetics data which will be incorporated into fin-trade management, and will detect fins from Oceanic whitetips found in the Western Atlantic. 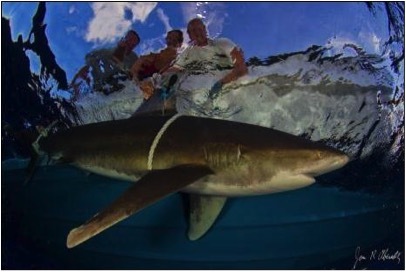 This year, over a six day cruise, the team captured and released a total of 15 oceanic whitetips, and attached pop-up satellite tags (PSAT’s) measuring archived temperature, depth and light levels(used to define location) to 12 females. The tags are pre-programmed to record for a desired deployment duration ranging from 14 days to 12 months before detaching from the animal. Once the tag detaches, a sub-set of archived data is transmitted to a satellite system, meaning the tag does not need to be recovered. The main focus of this year’s cruise was to tag confirmed pregnant (via ultrasound) and recaptured individuals, to identify hormone pregnancy markers, and potential pupping grounds. The oceanic whitetip shark (Carcharhinus longimanus). Photo by Sean Williams. Investigating these large knowledge gaps are intrinsic to the contemporary management of oceanic whitetip shark populations, and will provide novel insights into the biology and ecology of a severely threatened apex predator. The stingray team has been hard at work over the last month and has recently broken an important milestone passing n=300 capture events. We now have 347 captures with 195 individual rays (49 Himantura schmardae and 146 Dasyatis americana) and 152 recaptured rays. With the high level of capture events occurring this has enabled graduate student Daniel Montgomery to successfully tag 38 southern stingrays with temperature loggers, with 7 loggers having been retrieved from stingrays to date. Initial analysis of data has shown a diel pattern in temperatures experienced by stingrays possibly related to tidal cycles in these shallow water environments, however more tags are required in order to make more detailed analysis of trends in the data. Alongside this work Daniel has also been advising an Island School research class who will prevent initial findings of the study at the Island School Research Symposium at the end of May. 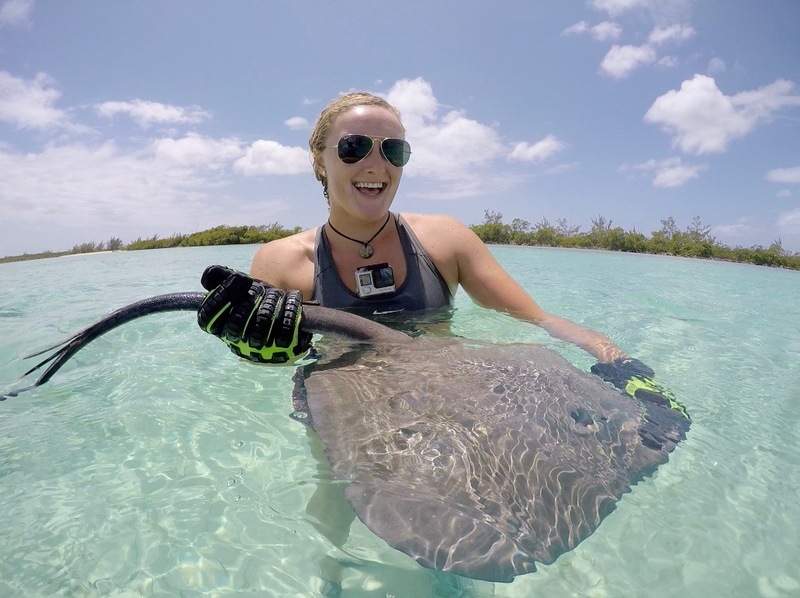 Other work conducted by the team includes continued sampling of Caribbean whiptail stingrays in order to analyse genetic connectivity of rays found in different locations throughout the Bahamas. 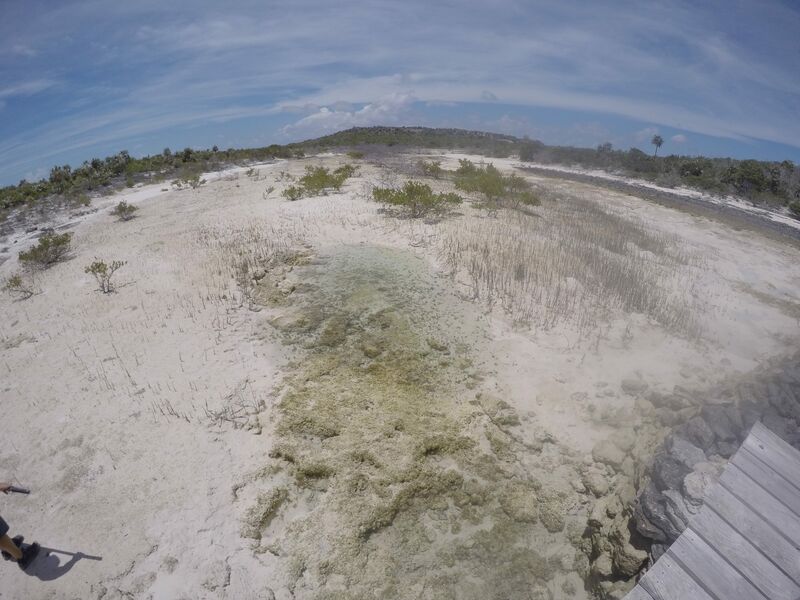 Recently the team explored a mangrove creek at Wemyss Bight after receiving a tip-off that several rays had been seen by fly fishermen the previous week. During a lengthy walk amongst the mangrove creek the team captured and sampled 5 immature whiptail rays added significantly to our current dataset. With the continued field work we anticipate capturing our 200th individual stingray across both projects in the near future! It’s Earth Day in Eleuthera! 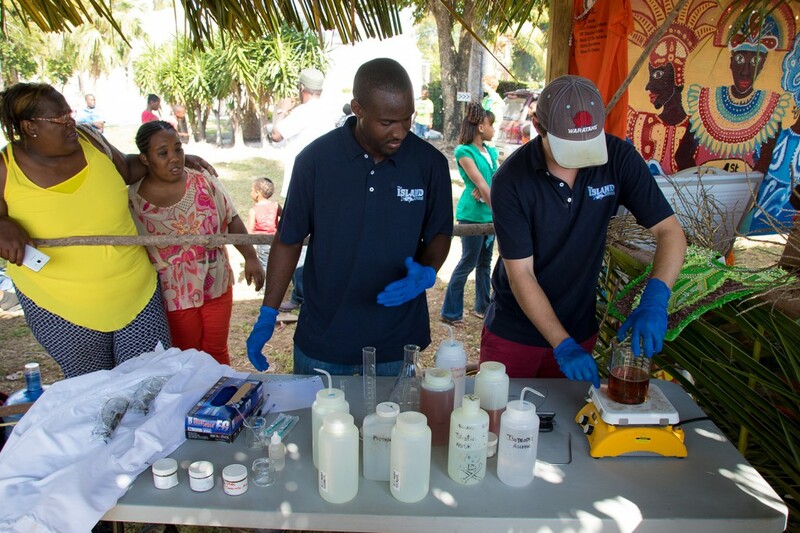 Last Saturday (April 23rd) the new Center for Innovation and Training hosted an Earth Day festival in Rock Sound at which the Cape Eleuthera Institute (CEI) and Center for Sustainable Development (CSD) community participated. The team, comprised if interns and staff, had a booth showcasing projects being conducted by CSD and information about our research initiatives and the environmental concerns they address. From the Center for Sustainable Development the biodiesel and facilities team member Sam Dorcent brought in a big crowd by making biodiesel right on site. Michael Bowleg, aquaponics technician, displayed a mini aquaponics system and discussed how sustainable farming is possible in sandy island environments. From the Cape Eeuthera Institute messages, games and information focused on: the invasive lionfish and the importance of culling this delicious, edible fish. 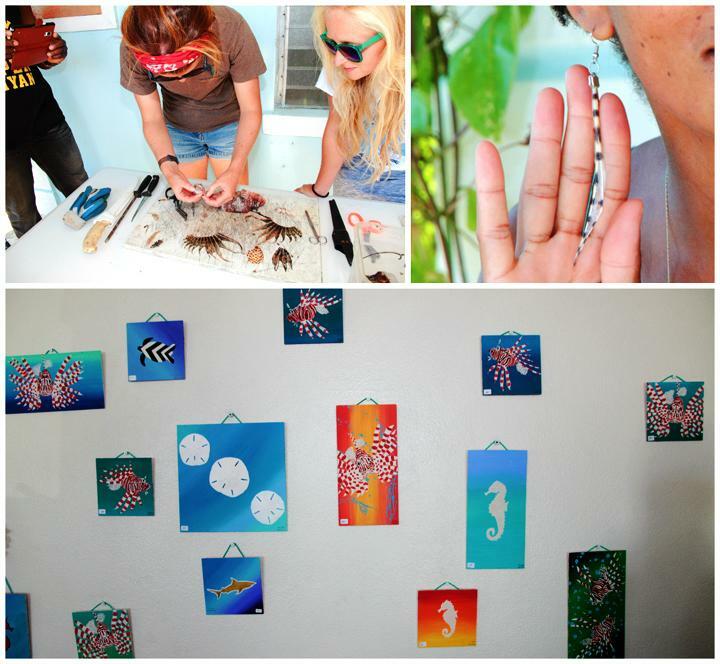 The reef team was also promoting lionfish fin jewelry made by local artists. Sustainable conch harvesting was communicated using visual aids, games aimed at debunking common fishing misconceptions and stressed the importance of harvesting only mature conch in order to keep this fishery alive in the future. 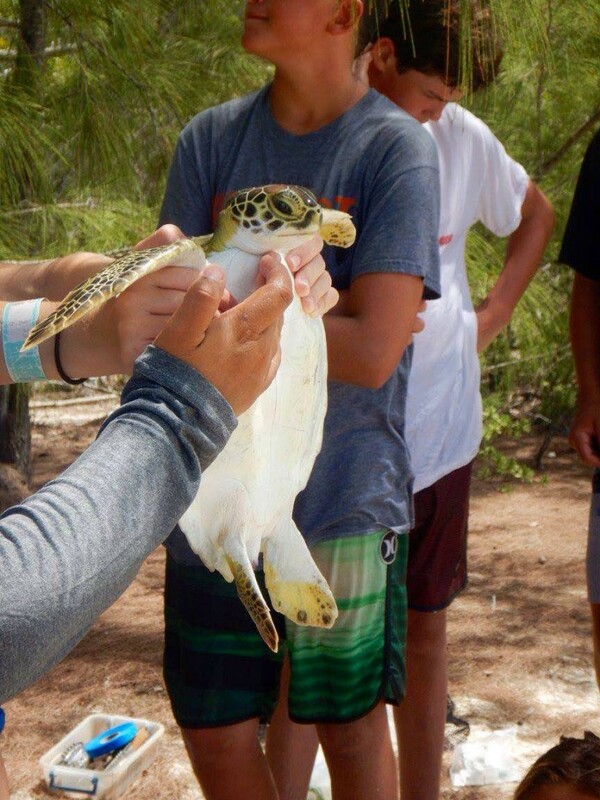 The regulations on sea turtle harvest in The Bahamas were explained and children were able to practice measuring turtles with a realistic stuffed toy sea turtle. Finally, several specimens of sharks and rays were on display and their importance in local ecosystems highlighted through a True/False quiz with children regarding the many misconceptions that surround sharks and rays in The Bahamas. The energy at the Earth Day festival was high with musical performances and vibrant food stands that really brought together the whole event. Overall the event was really successful, full of family fun and informed people about better ways to take care of the planet. We look forward to next years festival!